Low-viscosity epoxy curing agent for use with 5:1 Epoxy Resin. Extends working time and slows curing time in warmer temperature conditions. Not intended for clear coating applications. TotalBoat 5:1 Slow Hardener buys you a little more working time in warmer temperatures that tend to reduce working time and speed cure time of epoxy resins. You get a little more time to apply it because it won’t kick as fast. To get started, measure the mix of epoxy resin and hardener precisely, which is easy to do–especially with the pre-calibrated 5:1 Epoxy Pumps (sold separately). Combine 5:1 Slow Hardener with 5:1 Epoxy Resin in a five-part resin to one-part hardener ratio. Then spend about two minutes mixing thoroughly. The epoxy resin/hardener mixture can be used for wetting out fiberglass and other fabrics, coating, and bonding. The cured result is exceptionally strong and very moisture resistant. Note: Epoxy pumps may not be compatible between brands. 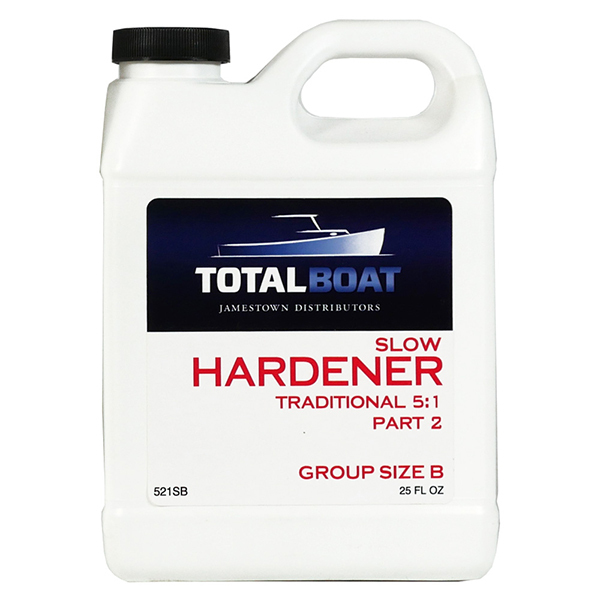 If using TotalBoat 5:1 Fast Hardener with a different brand of traditional 5:1 marine epoxy resin, be sure to confirm accurate mixing ratios based on the exact quantity each pump will yield. For best results, use either the TotalBoat Epoxy Pumps in the resin and hardener or the other brand’s pumps. Note: Not intended for clear coating applications. For clear coating applications, use TotalBoat Crystal Clear Hardener. Always wear protective clothing and equipment to protect your eyes, skin, and lungs when working with TotalBoat Traditional Epoxy Resin and Hardeners. Personal protective clothing should include appropriate gloves, safety glasses or goggles, a proper respirator, and a proper apron or similar protective clothing.